This training will open your door to the cruel but fair world of boxing. 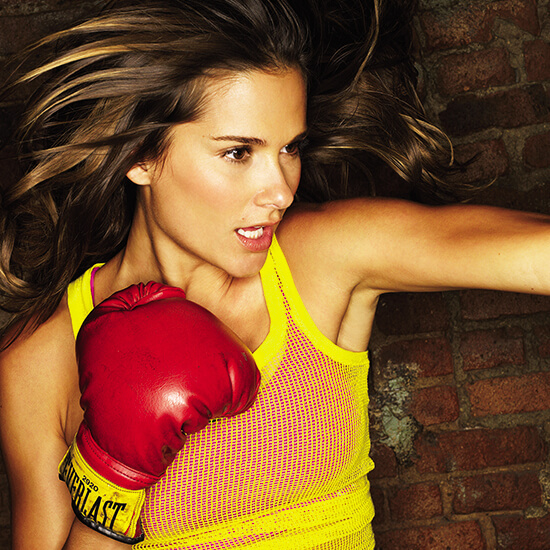 Go bolder and more active - and you can knock anyone out. And quickly. No violence, a banal blow to the psyche of appearance - a beautiful figure. First we congratulate each other and mentally embrace each other. Occasion? The debut of women's boxing at the 2012 Olympics in London. Finally, a blatant injustice is corrected. Prior to that, boxing remained the only summer Olympic sport where only men were "taken". But now they are not alone. We have a suspicion that changes have occurred for a reason. Recently, this sport and based on it fitness training are gaining increasing popularity among girls who want to stretch their fists and not only. "Wave" is possible both in classical boxing classes with elements of functional training, and in other group lessons (popular now Bodycombat, for example, - a high-intensity class with active use of martial arts elements). Fearless pioneers on the right path. Why? We tell. First, boxing is a double blow to an imperfect figure: a mixture of intense cardio and movements that form beautiful muscles. In addition, as explains the head of the "Martial Arts" direction of the company "Russian Fitness Group" Eugene Kostin, he improves coordination, helps to develop speed-strength endurance, gives self-confidence, finally. Some generally perceive boxing as a form of meditation. Unsurprisingly, the process requires complete concentration - which means it makes it possible to forget about everything and, of course, to release steam. Do you understand what we are up to? Must try. According to the program developed by the co-owner of the Aerospace High Performance Center in New York by Michael Olajade and adapted for you by Evgeniya Kostina, you can practice up to five times a week. Here in this order: round 1, rest up to one minute; round 2, rest; round 3 . If you get into the taste and want to burn more (calories-calories), give up respites. Get into the position of "feet on the width of the hips," one a step ahead of the other, the knees slightly bent. Raise your hands to the level of your shoulders and press your elbows against your body. The palms should look at each other. Watching? Then squeeze them into fists - so that the thumb pressed the middle phalanx of the index finger. If you have a left leg in front of you, turn your left shoulder slightly forward. If the right one is right. The pose is called a "boxing rack". Remember her. And do the punch - hit the far-hand straight in front of you at shoulder level, turning the torso and pulling the limb into a straight line. Simultaneously, unfold the fist with the palm down. Follow the free hand - it stays in place. Unlike punch , it is only applied to the opponent's hand (left, if you have a left leg in front, and vice versa). From the boxing rack, as quickly as possible, pull it straight in front of you at shoulder level, turning your palm to the ground. Remember that the blow ends only when the fist returned to its original position. It is applied in a circular motion, as if you "hug" someone or something in a quick way. To experience the process, try first to work out a blow with your elbow. Standing in the boxing rack, take the elbow nearest to the imaginary opponent's arm just to the side (that the angle between the shoulder and the body is 90 degrees) and perform a small circular motion so that it looks exactly forward, and the fist almost clung to the chin. The next step is a real blow: kick the elbow to the right angle between the shoulder and forearm and beat. Remember that the enemy is in front of you. Stand in the boxing rack. With one movement, lower the shoulder of the far arm, unbending the elbow to an almost right angle, turn the wrist so that the palm is pointed towards you, and strike the blow up. Imagine that the imaginary goal is at the level of your eyes - that's where the fist should stop. Take light dumbbells (from 300 g to 1 kg), stand in the left-side upright (in front of the left leg and shoulder) and apply to the "enemy" all three strokes in order in a slow, controlled pace. This is one repetition. Make these 12. Then put weighting agents and perform eight repetitions without them, resting a few seconds after each uppercut, and then immediately 16 more - as quickly as you can. Repeat the entire sequence first from the right-hand stance, now on the jabs and uppercuts with your right hand, punch on the left. Remember: dumbbells should not affect the quality of the blows. If you feel that it is too difficult to control the technique, take the weight easier. Step out with your left foot forward (from the position of the "foot on the width of the shoulders") and go down, bending the knees until the left thigh is almost parallel to the floor (a). Do eight repetitions slowly. Then, with your right foot, step into the "legs on the width of the shoulders" and squat, pulling the pelvis back until both hips are parallel to the floor (b). Make sure that your knees are just above the feet. Do as many squats as you can in 30 seconds. Then repeat all over again, changing your foot in the attack. Prepare for simple jumps: legs together, knees slightly bent, back straight, press strained. Hands bend in the elbows and press to the body so that the brushes were at the waist level. Make sure that the rope rotates only due to the movement of the hands, and the forearms were fixed. Try to push off from the floor only with your feet. When landing, the knees should remain slightly bent, and the heels do not touch the floor. Your goal is to do 20-30 repetitions. Take light dumbbells (again from 300 g to 1 kg), stand in the left-hand post and perform all four strokes in order in a slow, controlled tempo. This is one repetition. Put weighting and make the next 12, resting a few seconds after each hook, and then immediately - 16 at the maximum speed for you. Wait a few seconds and add 16 more quick repetitions. Put your feet wider than your hips and lift one leg (a). 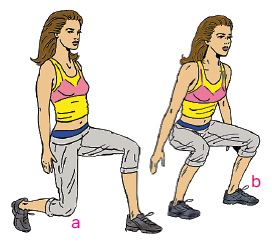 Bending the other knee, lower as low as possible, without touching the first limb of the floor (b). Pull back the heel to get back to the start. Do four repetitions slowly, and then as many as you can in 30 seconds. Change your legs and go all over again. Jump four times in such a sequence: on both legs, on the left, on both, on the right. Repeat in a circle until 2.5 minutes have elapsed. Take dumbbells, stand in the right-hand rack and inflict an imaginary opponent on all four strokes in order in a slow, controlled pace. This is one repetition. Put the weighting and execute the next 12, resting a few seconds after each hook, and then immediately 16 at the highest possible speed. Hold a few seconds of pause and make another 16 quick repetitions. Put your feet to the width of your hips, hands behind your head (a). Take the pelvis back, bending the knees until the femurs are parallel to the floor (b). Slightly raise both heels and try to hold on for 1 minute. If it's hard, you can lower the heels or shorten the exercise time. Jump on both feet for 2.5 minutes. When you get into a good rhythm, try to add jumps with crossing hands (school "cross-wise") - every 10-15 times.